Tax-advantaged retirement plans like IRAs allow your money to grow tax-deferred—or, in the case of Roth accounts, tax-free. 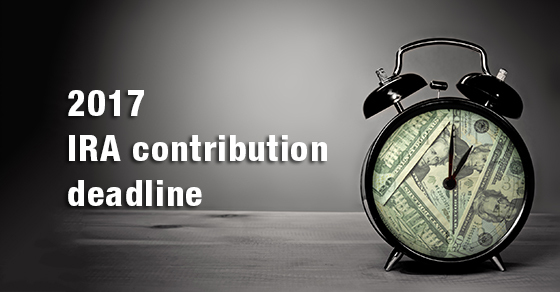 The deadline for 2017 contributions is April 17, 2018. Deductible contributions will lower your 2017 tax bill, but even nondeductible contributions can be beneficial. Taxpayers with MAGIs within the applicable range can deduct a partial contribution; those with MAGIs exceeding the applicable range cannot deduct any IRA contribution. Nondeductible traditional. If your income is too high for you to fully benefit from a deductible traditional or a Roth contribution, you may benefit from a nondeductible contribution to a traditional IRA. The account can still grow tax-deferred, and when you take qualified distributions you’ll be taxed only on the growth.